On the afternoon of 18 January 2017, a major avalanche occurred on Gran Sasso d'Italia massif, one of the mountains above Rigopiano, hitting a 4-star hotel in Pescara, in Abruzzo . The avalanche struck the luxury resort Hotel Rigopiano, killing twenty-nine people and injuring eleven others. The avalanche is the deadliest in Italy since the White Friday avalanches in 1916, and the deadliest avalanche in Europe since the Galtür avalanche in 1999. It was reported that shortly after a series of earthquakes hit the region, many of the hotel guests were gathered on the ground floor of the hotel awaiting evacuation when the avalanche struck. At the time, there were forty people in the hotel including twenty-eight guests and twelve employees. Upon impact, the avalanche caused part of the roof of the hotel to collapse, and moved it 10 metres (33 ft) down the mountain. Italian authorities estimated that the avalanche weighed between 40,000 and 60,000 tonnes when it hit the hotel and that the weight of the snow increased to 120,000 tonnes as the snow and ice pressing down on the building became heavier. Upon impact to the hotel the speed was around 100 km/h. The avalanche largely destroyed the four-star resort Hotel Rigopiano, killing twenty-nine people. A total of eleven people were rescued following the avalanche, including two people who survived the avalanche because they were standing outside the hotel when the avalanche hit. The survivors trapped inside the hotel, sheltered by lofts that had not collapsed, were located around 12:00 on 20 January, over 30 hours after the avalanche. Overall, five adults and four children trapped below the ruins and the snow were rescued, the last ones after 58 hours, having survived on frozen snow. Ten out of the eleven people rescued received minor injuries related to hypothermia. The eleventh person also received a compression injury to his upper arm, which he underwent surgery for. On 23 January, rescuers recovered a twelfth body, but also located three puppies alive under the snow, indicating that the twenty-two people missing may have still been alive. However, it was later revealed that no one else had survived the avalanche. Two causal factors for the avalanche of 2017 include a series of earthquakes that struck the region earlier in the day and the record snowfall which occurred in the region for days prior to the avalanche. Due to harsh conditions that inhibited helicopters from flying, first responders had difficulty reaching the hotel due to large amounts of snow which had fallen for several days prior to the accident. In addition, the presence of trunks and rubble on the streets slowed down the snow blower, so that the first rescuers arrived at the scene at 04:30 local time (03:30 GMT)  on Ski and stated that the hotel had been buried under at least four metres (13 ft) of snow, and that it could take days before they would know if there were any survivors. In addition, the base camp for rescue workers with ambulances was set up approximately 10 km (6 mi) away. Individuals from Emergency Services, Civil Protection, Alpine Rescue and Volunteers including asylum seekers worked with technology to track body heat, phone signals and other data, and drones to locate victims. After two days of working Emergency Personnel made contact with six survivors in an air pocket of the destroyed hotel and managed to rescue them. Five days after the avalanche, three puppies from the hotels resident dogs were found and rescued by workers, and reunited with their parents; Lupo (Wolf) and Nuvola (Cloud) who had escaped and found shelter in Farindola a nearby village. Individuals saw the puppies as signs of hope, but officials warned that their survival did not mean that more human survivors would be found. There was criticism over the amount of time it took emergency services to respond to the accident. A survivor who had remained outside the hotel following the avalanche called authorities for help, but allegedly Italian authorities did not at first believe that the accident had happened. Quintino Marcella, the owner of the restaurant L'Isola Felice in Silvi, received a call from the survivor and attempted to contact authorities on numerous occasions but was purportedly not taken seriously. On 23 January, local newspapers reported that prior to the avalanche, the owner of the hotel sent an email to local authorities expressing his concern for the hotel guests due to their panicky nature following the earthquakes. He stated that many hotel guests were planning on spending the night in their cars, out in the open. On 22 January, the mayor of Farindola, Ilario Lacchetta, announced that he was planning on filing a lawsuit against the satirical magazine Charlie Hebdo for allegedly publishing a cartoon mocking victims of the disaster. The cartoon depicts Death riding the avalanche down the mountain on skis holding two scythes instead of ski poles. Lacchetta stated that the cartoon "goes beyond bad taste," and was just as offensive as a similar satirical cartoon published by the same company, which mocked victims of the Amatrice earthquake in August 2016. Prosecutors launched a manslaughter investigation of the failure of authorities to respond to reports of an avalanche for many hours. In addition, an investigation was launched to determine whether Hotel Rigopiano was built on the debris of several previous avalanches which had taken a similar route down the mountain, therefore putting the hotel in danger. A year after the incident on January 18, 2018, victims relatives, local residents and representatives of the authorities and emergency services read prayers, poems and laid flowers outside the remains of the hotel during the Commemoration Day. There was also a display of those killed, with the words "Never Again" and photos of the victims. A family of survivors, the Parete's wrote a book about their experience Il Peso Della Neve. ^ Casa, Carolina. "HOTEL RIGOPIANO L'allarme inascoltato prima del disastro". Tgi-rai.it. Retrieved 19 January 2017. ^ Claudio, Lavanga; Jamieson, Alastair. "Italy Avalanche: Hotel Rigopiano Buried After Earthquakes, 'Many Dead'". NBC News. Retrieved 19 January 2017. ^ Henson, Bob. "More than 20 Deaths Feared in Italian Hotel Buried by Avalanche". Weather Underground. Retrieved 24 January 2017. ^ "Italy avalanche: Ten found alive in Rigopiano hotel after two days". BBC News. Retrieved 26 January 2017. ^ "Death toll of Italy hotel avalanche keeps rising, as first funerals held". Global Times. Xinhua. Retrieved 25 January 2017. ^ "Rigopiano hotel avalanche: Italian rescuers find no sign of life". BBC News. Retrieved 19 January 2017. ^ Rome, Josephine McKenna. "Avalanche boy left an orphan as parents confirmed dead". Independent. Retrieved 23 January 2017. ^ a b c "Italy marks one year since deadly Rigopiano avalanche". 18 January 2018. Retrieved 20 April 2018. ^ a b Lavanga, Claudio. "Italy Quake Avalanche: Four More Survivors Pulled from Buried Hotel Rigopiano". NBC News. Retrieved 22 January 2017. 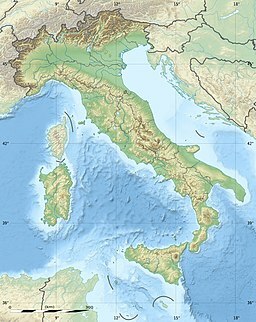 ^ a b "Italy's Rigopiano hotel death toll reaches 29, rescue operation over". TASS Russian News Agency. Retrieved 26 January 2017. ^ Denti, Antonio. "More survivors in Italian avalanche hotel as death toll rises to five". Reuters. Retrieved 21 January 2017. ^ "Italy rescuers race to find 23 missing in avalanche hotel". Business Standard. Agence France-Presse. Retrieved 21 January 2017. ^ Gagliardi, di Andrea; Tripodi, Alessia. "Hotel Rigopiano ten survivors, so far pulled alive a woman and four children". 24 Ore. Retrieved 5 February 2017. ^ Mensurati, Marco. "Rigopiano, the story of the survivors: "We lived by drinking snow"". Repubblica.it. Retrieved 5 February 2017. ^ Giuffrida, Angela. "Italy avalanche: many feared dead as Rigopiano hotel engulfed". The Guardian. Retrieved 19 January 2017. ^ "'Angels! Angels!' Avalanche Survivors Call Out to Rescuers". FOX 40. CNN. Retrieved 21 January 2017. ^ "4 more survivors pulled out of Italy's avalanche-hit hotel". Fox News World. Retrieved 22 January 2017. ^ "Italian avalanche: hope for survivors after three puppies found alive in rubble". The Guardian. 23 January 2017. Retrieved 24 January 2017. ^ Geggel, Laura. "Earthquakes or Snowstorms? Cause of Italy's Deadly Avalanche Debated". Live Science. Retrieved 20 January 2017. ^ Mignucci, Robert. "Avalanche destroys Italian hotel, up to 30 feared dead under snow". Reuters. Retrieved 19 January 2017. ^ "The terrible truth about the victims of the avalanche in Italy". FiveAA.com. Retrieved 20 January 2017. ^ "Italy's Hotel Rigopiano was buried under an avalanche, but Italian authorities reportedly didn't believe it happened". Stuff.co. Retrieved 19 January 2017. ^ Bever, Lindsey (24 January 2017). "After deadly Italian avalanche, a glint of 'hope' — 3 puppies rescued from the rubble". Washington Post. ISSN 0190-8286. Retrieved 20 April 2018. ^ Osborne, Samuel. "Italy earthquakes: Many feared dead in hotel buried by avalanche". Independent. Retrieved 19 January 2017. ^ "Italian authorities question how earthquake risks were handled while search for survivors continues". CBC News. Associated Press. Retrieved 23 January 2017. ^ "'No satire': Italian town hit by avalanche to file lawsuit against Charlie Hebdo over caricature". Apsny News. Retrieved 22 January 2017. ^ Agnew, Paddy. "Italian investigators to see if controversial avalanche hotel built in danger zone". The Irish Times. Retrieved 27 January 2017. ^ "Avalanche victims 'died of impact, not hypothermia". The Local.it. Retrieved 2 February 2017. ^ "peso della neve. Storia della nostra famiglia sotto la valanga di Rigopiano - Parete, Adriana - Parete, Giampiero - Ebook - EPUB con DRM | IBS". www.ibs.it (in Italian). Retrieved 20 April 2018. Wikimedia Commons has media related to Rigopiano avalanche.